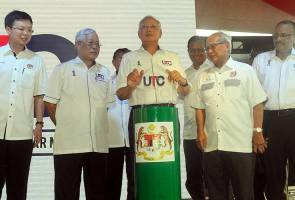 MIRI: Prime Minister Datuk Seri Najib Tun Razak today described the setting up of UTCs (Urban Transformation Centres) nationwide as one of the greatest innovations taken by the government in serving the people. "They are an effort to determine the most innovative and creative deliverance of services to the people. "Our UTCs have among the best such models in the world and even the World Bank described them as exemplary," he said when opening the Miri Urban Transformation Centre here today. He said Malaysia was far ahead because most advanced countries in the world did not have such centres which offered important services to the people from 8am to 9pm daily, during public holidays and on weekends. The centre is the second in the state after the one in Kuching and the next will be in Sibu, the setting of which has just started. Najib said since the UTC initiative was started in 2012, there were now 12 UTCs in the nation and last year some 11.5 million people had benefited from the many services offered by government departments and agencies in them. "From feedback received from the ground, the people are very satisfied and comfortable with the UTCs which are very convenient to them as the services are available under one roof. "They can even seek treatment at the 1Malaysia clinics there which only charge the country's citizen a very nominal fee," he said. Najib reiterated that his government was "not an advocate of populist politics nor politics of inciting hatred against leaders" but one that only wanted to serve the people most effectively. Earlier, Sarawak Minister of Infrastructure Development and Communications Datuk Seri Micheal Manyin in his speech had urged the federal government to build more UTCs in the state in towns like Bintulu and Serian. Manyin, who represented Chief Minister Tan Sri Adenan Satem at the function, said the Miri UTC since its operation early this year had served more than 23,000 people so far thus proving its popularity. Najib had earlier the Syarikat Perumahan Negara Berhad's (SPNB) Vista Perdana (Phase 2) housing project site at the Permyjaya new township near here.